Dr Devindra S holds M.Sc, M.Phil and Ph.D degrees in Biochemistry. Currently he is working in Microbiology & Clinical Division at NIN, ICMR. 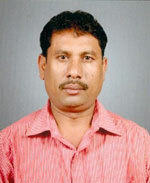 He is recipient of best paper award, 2007 (Sirohi Award) from Indian Society for Plant Physiology. He also received a NSI Prize for the “Best poster presentation” in 48th National Conference of the Nutrition society of India. He worked on the database of carbohydrate fractions in Indian food followed by glycemic index/load. He has developed a modified anthrone method for the quantification of available or glycemic carbohydrates of Indian foods. Presently he is working of the prebiotic potential and other health benefits of legume raffinose family oligosaccharides in animal model. He is also working on the enzyme replacement therapy for fabry disease. His studies confirmed that legume raffinose family oligosaccharide proven to be a potential probiotics. He also carried out basic studies to support his clinical findings and demonstrated the role legume oligosaccharide on gut bacteria, Inflammation and lipid profile. With his contribution and recognition in the field of nutrition sciences he has been invited as speaker in National/ International conferences. Currently, he is working on the effect of legume prebiotics on the control of obesity and diabetes in induced animal model. He is also working on the production of alpha galactosidase from plant, microbial and cell line as potential enzyme replacement therapy for fabry disease. Sreenivasa Rao J, Devindra S, Bhaskarachaty K and longvah T. Determination of trace metal content in Indian marine fish using closed vessel microwave digestion. Advances in Fish Research2013 6, 187-199. Devindra S, Longvah. T. A new Approach for the Measurement of Digestible Carbohydrates in different Food Samples with HPLC-RI. Journal of Agricultural Science and Technology B1. 2011 (8b), 1216-1223. Best paper award (Sirohi Award), 2007 from Indian Society for Plant Physiology. NSI Prize for the “Best poster presentation” in 48th National Conference of the Nutrition Society of India.